Just on the border of the Roaring Forties, that are showing their best side ever, the weather is fine. Not really warm, but quite OK.
Before the start of the VG I continued swimming in the lake at my home. When I moved to Sables several weeks before the start I switched off all heating in the house I rented and since the summer I have only showered cold. In that house it got so cold at night that when one of my sons visited me he slept with all his clothes on under double blankets. And ahhhh…I have not had a shower since before Cape Town, that is at least since early December: for about 2 months! Of course I have tried to be a bit hygienic, “washing” with baby wipes, but it is not the real thing. And you can’t wash your hair with baby wipes! What a fantastic feeling to wash and not to smell yourself anymore (then you have really reached a serious point !). Only issue: somewhere I had a towel, but it got lost, so drying in the cold wind. Well, in comes the brown fat again. Specially for “showering” on board I have a 5 liter insecticide spray tank, on which a longer hose with a shower head. good track of how much water is still in the tank, otherwise no rinsing off of soap. And for the watermaker to make 5 liters: that is more than an hour’s work for the poor little watermaker. No fun to sit in the cold outside for an hour all soaped up! 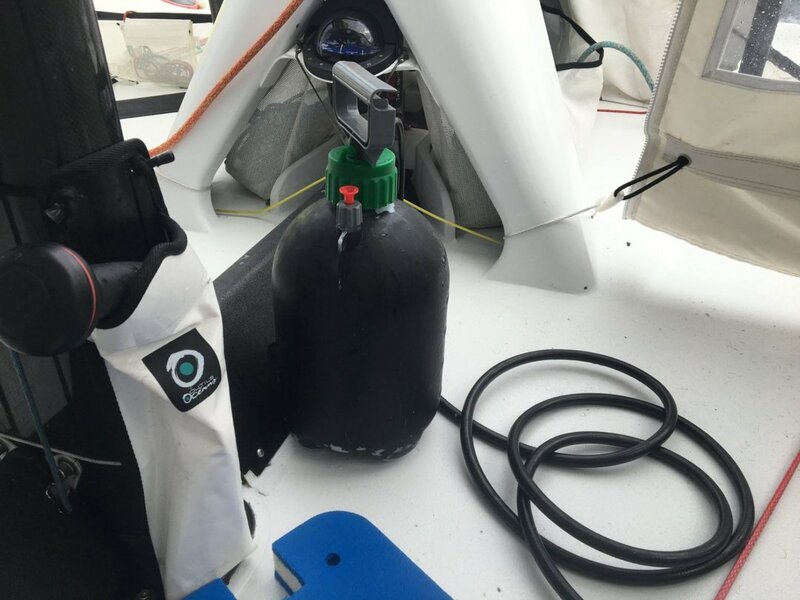 From now on till close to les Sables the spray tank stays in the cockpit and whenever I have some water left over it goes in there so I have the shower ready !